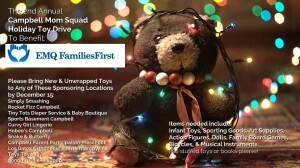 The Campbell Mom Squad is hosting a drive for EMQ FamiliesFirst, ending Dec. 15. With Christmas just about two weeks away, a number of Bay Area toy drives have deadlines coming up in the next several days leading up to, and during, this weekend. Another wave of deadlines will come the following weekend. If you’re looking for ways to help those in need this holiday season, the San Jose Mercury News recently published a list of more than 25 organizations and agencies requesting the public’s help. The groups were asking for everything from cash donations, to gift cards, food, clothing, blankets, unwrapped toys, and even things like gift wrap and bows. For example, groups and agencies like Asian Americans for Community Involvement (AACI), the City of Saratoga, the Gardner Family Care Corporation, the Jewish Family Services of Silicon Valley, and Catholic Charities of Santa Clara County are in need of new, unwrapped toys, books, and other gifts. The Bill Wilson Center needs lots of gift cards to give to the youth in their program. Many of the teens and young adults don’t get to go shopping very often for something new, and gift cards allow them to get the size, style, and color of the things they need and want most. Family Supportive Housing is seeking donations of new pillows and blankets (both twin and full sizes), new socks and underwear for children, as well as unwrapped toys and gift cards. 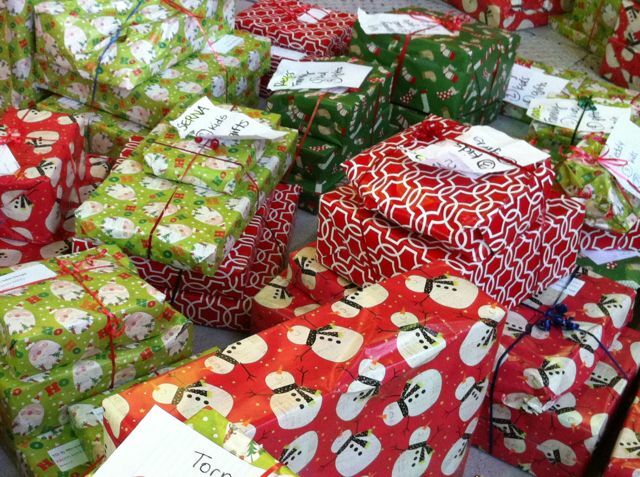 Alum Rock Counseling Center could use not only toys and bikes for approximately 200 children, leaders are also asking for donations of large rolls of wrapping paper, tape, ribbons and bows, baskets, tinned cookies, candy, bottled water, and more. See the complete list for more information. If you know of additional holiday donation opportunities in the San Francisco Bay Area, please tell us in comments.